A number of options are available for conclusive detection of the presence of mycoplasmas in contaminated cell cultures. A commonly but unreliable method is the DAPI staining of cells followed by microscopic analysis. However, PCR based methods give the most reliable results for routine checks. 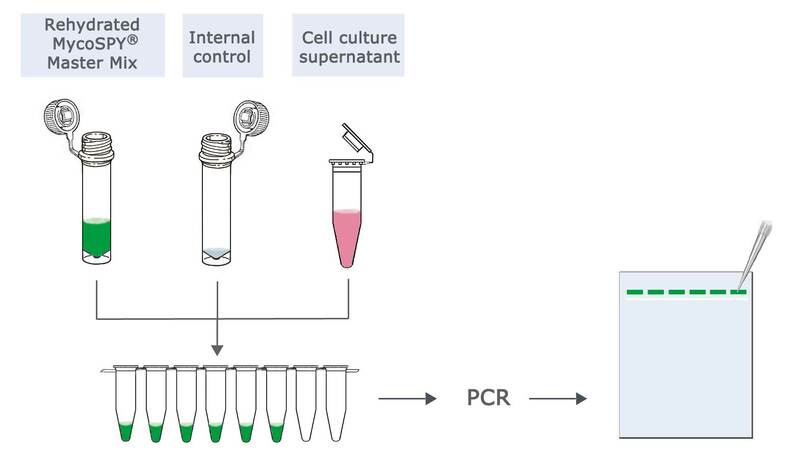 Biontex MycoSPY® and MycoSPY® Master Mix detection kits are rapid, reliable and highly sensitive methods of PCR-based mycoplasma detection in cell cultures. The MycoSPY® Master Mix contains a complete range of components for PCR analysis. Each mycoplasma test kit additionally contains an internal control and PCR-grade water for rehydrating the Master Mix. If mycoplasmas have been detected in your cell culture, the highly effective antibiotic mixture MycoRAZOR® eliminates the contamination rapidly and efficiently. More than a quarter of all animal cell cultures are contaminated with mycoplasmas / mollicutes. The strains most commonly found in cell cultures, with a total probability of 94%, are: M. fermentans (47%), M. hyorhinis (19%), M. orale (10%), M. arginini (9%), A. laidlawii (6%) and M. hominis (3%). In addition, the following strains were found with lower probability: M. bovis, M. pneumoniae, M. salivarium and M. synoviae. All these mollicute strains, in addition to a variety of other strains, are detected by MycoSPY® Master Mix. BLAST analysis was used to verify of the primer specificity .